Week two of my challenge went better than the first week. I was better prepared in terms of having food ready to prepare. This made it much easier, I had done some meal planning and knew what I was going to take for lunch at work (corn on the cob). I cooked a roast chicken and had left overs for several days. 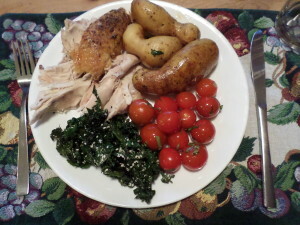 Roast Chicken from Thornhill farm, Peruvian Fingerling potatoes, Kale, Tomato and Basil salad all from my garden. By the third week however, I found myself getting a little tired of the limited flavours of food. Having only herbs and butter to season foods, was starting to feel really limiting. I made the decision to alter my rules and add in olive oil and vinegar. This made salads much more interesting. Some may call this cheating and perhaps it is. But…I have beautiful veggies still in the garden and wanted to make use of them before they are gone. For instance, I had some lovely cherry tomatoes, basil, add a little oil and vinegar and you have deliciousness. Not they are bad on their own, but the increase in flavour was wonderful. I have also done some stir fries, and while I really miss the Asian flavours I usually add, with a little olive oil, they are still tasty. One thing I realise is that I really miss actually trying out new recipes and using a variety of ingredients. This is something I do frequently. This past Saturday I was able to go to the Peninsula Country Market and bought all the veggies that I am not growing (onions, green beans, zucchini, salad mix, and spinach). I hadn’t been able to do that the previous weeks as I had been busy on the weekends. 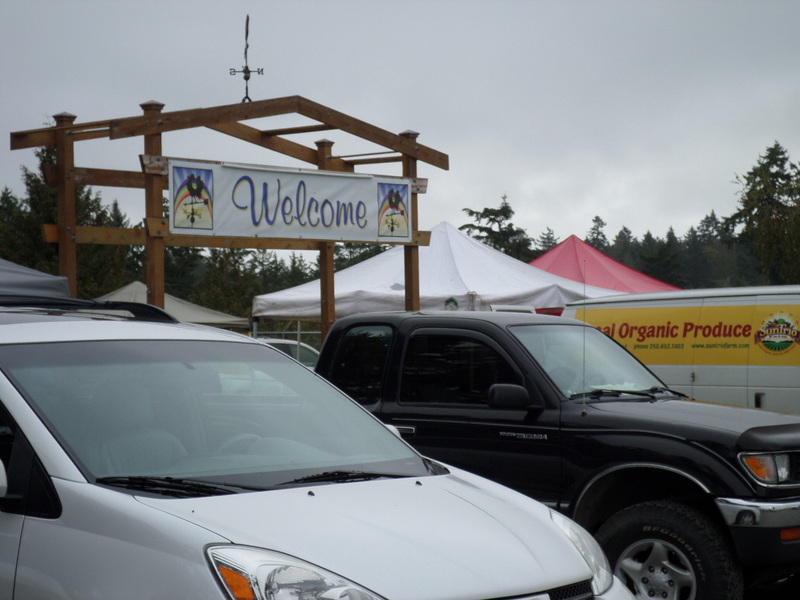 This means a lot less travelling around finding various things wherever I see farm stands this week. Rather fun, but time consuming. At this point I am really looking forward to my experiment being over. While I am not feeling caffeine deprived, I am looking forward to drinking my wide variety of teas again. I think that is one of the biggest things actually, as I usually drink several cups of tea throughout the day. I am not especially craving sugar, but creamy things like coconut milk yogurt. I have had a few sweet things, when I have been out for dinner, but I don’t eat a lot of sugary things anyway. It’s really the snack foods that I am missing, not actual meals. Meals have ingredients not terribly different than what I’m eating now, just with some different flavours. I’ll have to put some thought into what I want to eat first…. maybe chocolate??? Maybe a mocha with whipped cream??? ?